Marcus Junius Silanus and Lucius Scipio win victories in Spain. Gaius Claudius Nero had won fame for his actions at Capua and for taking charge of the army in Spain after the defeat of Gnaeus and Publius Scipio in 211 BCE. He was now a shoo-in for the consulship. Nero was known for his fiery temperament and it was widely believed that he needed a more moderate colleague at his side. Since Nero was a patrician and it was illegal for two patrician candidates to be elected consul, Quintus Fabius Maximus and Marcus Valerius Laevinus, who because of their vast experience would have been excellent choices, were not available. The comitia centuriata then elected a bit of a dark horse, Marcus Livius, later nicknamed Salinator. Livius had led the Romans in the Second Illyrian War in 219 BCE and had later been sent as an envoy to Carthage to protest Hannibal’s assault on Saguntum. However, at an unspecified moment he had been convicted by the people for embezzling some of the booty from the Illyrian expedition. Believing that the conviction was unjustified, Livius had left politics and retired to the countryside. It was not until several years later that he was recalled to Rome by Marcellus and Laevinus. But Livius still held a grudge against his fellow Romans, walking around in mourning garb all day. Ultimately the censors had to force him to shave and take off his rags, and to appear in the Senate to discuss the fate of his relative Gaius (or Marcus) Livius, the commander of the Roman garrison at Tarentum who had been so negligent. On this occasion he truly returned to politics again, and now he was elected consul. Nero was sent south to Bruttium and Lucania to fight against Hannibal and his allies, while Livius was sent north to stop Hasdrubal before he could unite with his brother. Hasdrubal had broken out of Spain after his defeat at the Battle of Baecula the previous year and he was now rapidly approaching the Alps. Rome had received warnings from her ally Massilia in Southern Gaul and there is every reason to believe that the Romans were very nervous about this news. The censors Marcus Cornelius Cethegus and Publius Sempronius Tuditanus concluded the census this year and reported that there were just 137.108 Roman citizens. The reliability of these figures can be doubted and one possibility is that the censors simply omitted the citizens serving in the armies. It is, however, clear that the Roman population had decreased dramatically during the war. Although a drop from 270.212 Roman citizens in 220 BCE to just 137.108 twelve years later is more than a little incredible, surely the censors had nothing but bad news to report. Now for the first time the Romans forced the Roman colonies on the coast to provide troops for the Roman armies. Unlike the Latin colonies, these colonies of Roman citizens were administered directly from Rome. Their citizens were legally exempt from military service, as they were already required to protect the coastal areas with ships. For obvious reasons, the colonies protested against the decision and appeared in the Senate, but only the complaints from Antium and Ostia were upheld. The other colonies were required to send soldiers anyway. The Romans again had 23 legions in the field this year. Hasdrubal Barcas’ journey to Italy seems to have proceeded a lot smoother than that of his brother eleven years previously. In fact, his advance was so quick that the Carthaginian general surprised the Romans, which no doubt added to the panic. The praetor Lucius Porcius Licinus sent word to Rome that Hasdrubal had already arrived in Gallia Cisalpina and that he urgently needed reinforcements. The consuls now quickly set out for their provinces. In the mean time, Hasdrubal wasted a lot of valuable time by laying siege to the Latin colony of Placentia. Apparently he believed that the colony would be an easy target, but the inhabitants managed to repulse his attack and Hasdrubal had no time for a lengthy siege. His mission was to join forces with his brother. In Lucania, the consul Nero had taken charge of an army of 40.000 infantry and 2.500 cavalry. Hannibal was camping near Grumentum, the site of a small Roman victory in 215 BCE. Here at Grumentum, the two armies met, and unfortunately we only have Livius’ account of the ensuing battle. It is difficult to determine how reliable it is. Nero seems to have copied the Hannibalic tactic of trying to hide some men behind the enemy line. When the two armies had clashed not far from the Carthaginian camp, the Romans suddenly appeared on the hills behind Hannibal’s soldiers and threatened to cut them off. Hannibal now quickly ordered his troops back into the camp, making Livius’ claim that 8.000 Carthaginians were killed and 700 captured rather ludicrous. At best the outcome of the battle was a small tactical victory for Rome, but Hannibal did retreat to Apulia, where Nero caught up with him at Venusia. After some skirmishes, Hannibal marched east and went to Metapontum. And then something crucial happened. Hasdrubal had given up the siege of Placentia and had sent four Celtic and two Numidian horsemen with a letter to Hannibal. These men got lost and were captured by a Roman foraging party. The letter was discovered and the horsemen were taken to the consul Nero to be interrogated. After the letter had been translated and the men questioned, the consul learned that the two brothers were to meet at an unspecified location in Umbria. So in other words, Hannibal was urged to march north and meet up with his brother there. Nero now did something extraordinary. He informed the Senate about Hasdrubal’s plans and then peeled off a picked force of 6.000 infantry and 1.000 cavalry from his army. Feigning an attack on a city in Lucania to keep Hannibal where he was, the consul instead force-marched this mini army north towards Picenum. It was an incredibly bold action, but with hindsight we can say that it worked. On the way to Picenum, Nero’s soldiers were provided with supplies by the local populations; they were marching with just their arms and armour. Volunteers – both veterans and young men – joined them on the way, increasing their numbers. 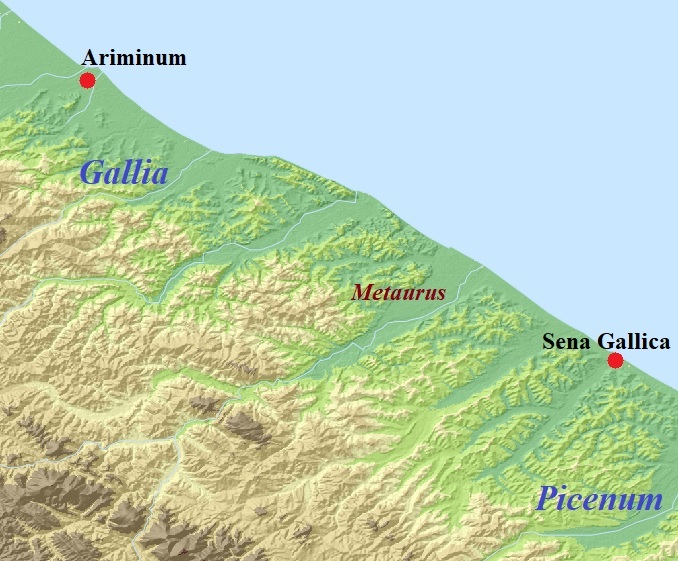 The consul Livius and the praetor Licinus had their respective camps near Sena Gallica, a Roman colony on the Adriatic Sea. Hasdrubal was camping less than a kilometre away. When Nero arrived in the vicinity, he ordered his men to hide in the hills and wait until it was dark. He then resumed his march in silence and entered his colleague’s camp during the night. It had already been decided not to enlarge the camp, as this would only arouse Hasdrubal’s suspicion. The consuls’ camp must therefore have been crammed with soldiers. Although they were surely exhausted, Nero gave his soldiers no rest and convinced Livius, Licinus and the war council (consilium) to attack Hasdrubal immediately. The red vexillum was raised and the Romans marched out for battle the next day. Site of the Battle of Metaurus (source: Ancient World Mapping Center. “À-la-carte”; CC BY 4.0). Hasdrubal would probably have accepted battle had he not discovered men with old, weathered shields and emaciated horses among the Romans ranks. The army also looked larger than he had anticipated. When it was reported to him that a trumpet had been sounded twice in the consul’s camp and only once in that of the praetor, he realised the other consul was present as well. It is not clear how large Hasdrubal’s army was. Polybius nor Livius mention its size, and the figures given by Appianus (ca. 95-165) – 48.000 infantry, 8.000 cavalry and 15 elephants – may be a little too high. It was a sizeable force, but many of the soldiers must have been recently recruited Celts. Livius also mentions some 8.000 Ligurians. Hasdrubal’s crack troops were Spanish veterans, but no North African soldiers are mentioned in any of the sources. We know that North Africans were captured at the Battle of Baecula the previous year, so some of them must have been present at the Metaurus as well. But whatever the size of Hasdrubal’s army, the general thought it wiser to refuse battle and to retreat. The two consuls and the praetor pursued and caught up with the Carthaginians at the river Metaurus north of Sena. Here, on 22 June, one of the most decisive battles of the Second Punic War was fought. Livius commanded the Roman left flank, while Nero was in charge of the right flank and the praetor Licinus commanded the centre. Hasdrubal’s Spanish veterans clashed with Livius’ troops and some fierce fighting ensued, with the elephants causing panic and casualties on both sides. Meanwhile, Nero was facing the Celtic troops, but the hilly terrain in front of him was too difficult for a direct assault and the consul could not find a way to flank the enemy line either. Nero then demonstrated his boldness again by simply taking a few maniples away from the Roman right flank and marching them behind the Roman battle line over to the left flank. There they outflanked Hasdrubal’s Spaniards and cut them to pieces. The Carthaginian right flank was now rolled up and the furious Romans quickly reached the Celts on the hilly terrain and made short work of them too. After the battle the Romans captured the enemy camp and took 300 talents worth of booty from it. Polybius claims that 10.000 Carthaginians and Celts were killed and 2.000 Romans. Livius mentions 8.000 Roman casualties and the rather hilarious figure of 57.000 slain Carthaginians. Whatever the exact numbers, Hasdrubal’s army had been routed and was no longer a threat. The general himself had been killed in the fighting and several thousand enemy soldiers were captured. Many of the elephants had been killed by their mahouts when they were running amok, but the Romans had also managed to capture a handful of them. All of Rome rejoiced because of the victory and the Senate ordered three days of public thanksgiving. After the battle, the consul Nero decided not to lose any time. According to Livius, he was back with his troops in Apulia in just six days, having covered a distance of some 400 kilometres. It should be noted that the way the consul treated Hasdrubal’s body was shameful. While Hannibal had treated the slain Marcellus with great respect the previous year, Nero had Hasdrubal’s head cut off and took it with him to Apulia. There he had some men ride up to Hannibal’s camp where they tossed the severed head towards the outposts. Captured Africans were then paraded in plain sight and two were released to report to Hannibal about what had happened. 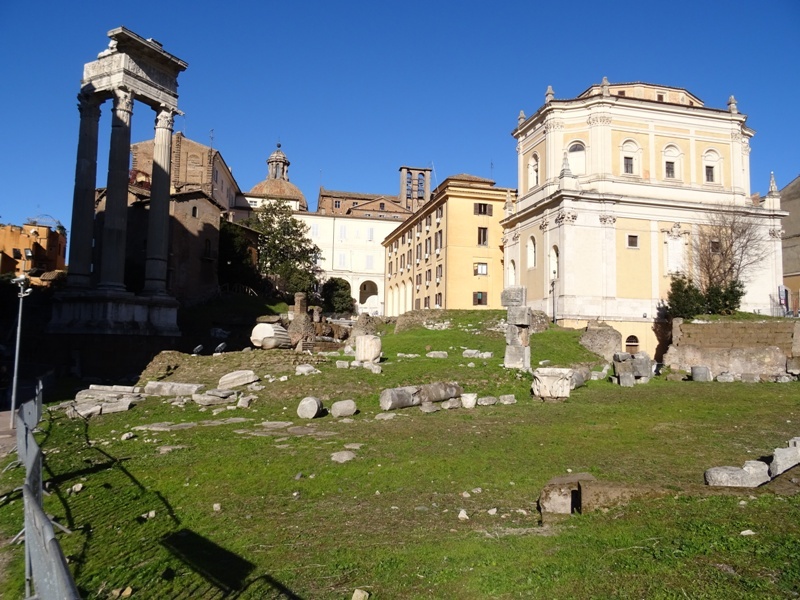 Remains of the temple of Bellona (in the foreground). Later this year, both Livius and Nero were awarded a triumph by the Senate in a session held in the temple of Bellona, outside the pomerium. However, only Livius’ army had returned to Rome while that of Nero was still in the field. Since the battle had furthermore been fought under Livius’ auspices, the consuls decided that Livius was to ride in a chariot while Nero followed on horseback. In other words, Livius held a proper triumph while Nero was given the lesser honour of an ovatio. The historian Livius – who may or may not have been a distant relative of the consul – claims that Nero was the true star of the triumph, and that he also had the somewhat dubious honour of being the principal subject of the ribald rhymes traditionally sung by the soldiers in the triumph. It should be noted that this was the first triumph held during the Second Punic War. The Romans finally had something to celebrate. The Romans do not seem to have been involved in any serious fighting in Greece this year, but their allies suffered badly and one of them was even knocked out of the war altogether. King Philippos V of Macedonia again managed to devastate Thermon, the political and religious centre of the Aetolian League. He had done so previously in 218 BCE, and now he simply destroyed the votive offerings that he had left untouched on that occasion. 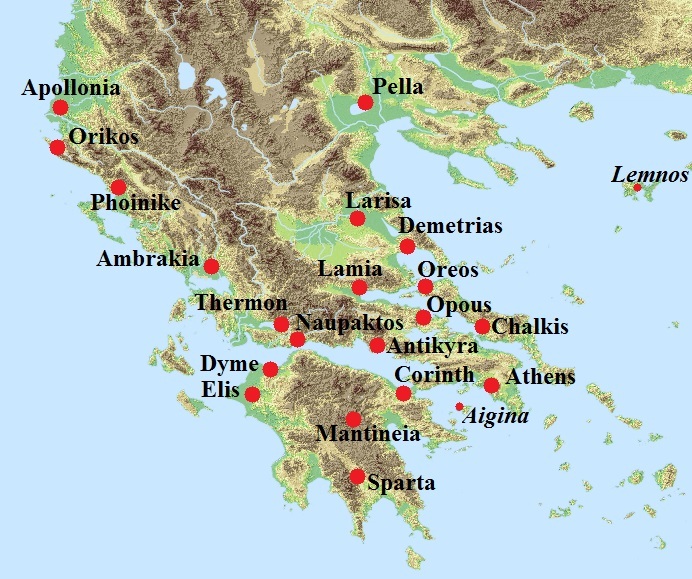 And while neutral nations such as Rhodos, Chios and Mytilene on Lesbos again tried to mediate in the conflict, the only large-scale land battle of the entire First Macedonian War took place at Mantineia in the Peloponnesos, with not a single Roman or Macedonian soldier participating. Greece, Macedonia and Epirus (source: Ancient World Mapping Center. “À-la-carte”; CC BY 4.0). The army of the Achaean League was now commanded by the capable strategos Philopoimen. In a mere eight months, he had drilled the League’s previously weak army into a solid fighting force. In June of this year, it clashed with the Spartan army led by the tyrant Machanidas, a Roman ally. Machanidas had some early success and managed to rout the Achaean left wing, his mercenaries driving the Achaean mercenaries and the Illyrians and thorakitai behind them all the way back to Mantineia. But the tyrant then pursued the fleeing enemy instead of attacking the exposed Achaean centre. This gave Philopoimen a chance to recover and defeat the Spartan infantry. When Machanidas returned, it was too late. The Achaeans had formed up their army behind a ditch, and when the tyrant tried to jump over the ditch to escape, he was unhorsed and killed. Achaean casualties were light, those of Sparta severe. Rome had lost another ally, and her list of allies in Greece was now growing dangerously thin. 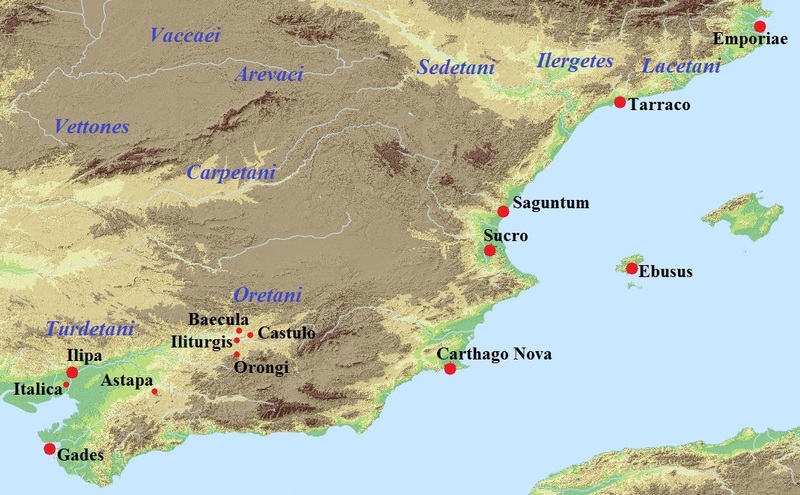 In Spain, the Romans now controlled most of the east coast of the peninsula, but the Carthaginians were not yet beaten. A new commander had been to Spain to replace Hasdrubal, and this Hanno set about recruiting troops among the Celtiberian tribes. Scipio sent Marcus Junius Silanus against him with a small army of 10.000 infantry and 500 cavalry. Silanus almost managed to surprise his opponent, and the ensuing battle was fought on broken ground. Because of the terrain, the Celtiberians could not use their preferred tactic of concursare (literally ‘running around’), of charging and retreating again. The Romans soon got the upper hand in the fighting and quickly routed the enemy scutarii. Hanno was taken prisoner, but the other Carthaginian general, Mago Barcas, managed to get away. He took the remains of his army to Gades in the deep south of the peninsula, where he joined Hasdrubal, son of Gisgo. Map of Spain (source: Ancient World Mapping Center. “À-la-carte”; CC BY 4.0). Scipio then sent his brother Lucius to attack the rich city of Orongi in the territory of the Bastetani. Lucius Scipio had just 10.000 infantry and 1.000 cavalry with him, so the city cannot have been that large. It was nevertheless important, as its soil was fertile and Orongi also commanded several silver mines. After a first assault was repulsed, the Romans redoubled their efforts and captured the city. A band of citizens trying to flee the city and surrender was massacred, as the Romans suspected foul play. If we are to trust Livius’ account, the Romans lost just 90 men in the entire operation. What is certain is that they were one step closer to a complete victory in Spain. Before retiring to his winter quarters, Scipio sent Lucius back to Rome with Hanno and the other high-ranking prisoners of war. Polybius, The Histories, Book 11.1-11.18. Richard Miles, Carthage must be destroyed, p. 305. 214.000 citizens are mentioned again for 204 BCE. For that year, Livius 29.37 explicitly states that the censors had sent out men to count the number of citizens serving in every army in the field. Their names are Alsium, Anxur, Minturnae, Sinuessa and Sena Gallica. See Livius 27.38. Polybius does mention 10 elephants in the Carthaginian army (Polybius 11.1). African prisoners are in fact mentioned after the battle (Livius 27.51). Livius claims that Hasdrubal himself had invented the method of killing them with a hammer and chisel, but this is probably just a popular story with no historical basis (Livius 27.49). Not impossible if the consul took only his cavalry with him. Not counting the ovatio held by Marcellus in 211 BCE after the capture of Syracuse.